Applying is a complex process, and the truth is, universities are not making it any easier with their websites. A 2012 survey revealed that 55% of students said that the biggest challenge with university websites was not finding the information they wanted because of the complexity of the website. This remains a real issue today. Given the amount of options available, if a student can’t find the information they want and need to make a decision, their application will go elsewhere, where they can find readily available answers to their questions. Universities must also take into consideration that their prospective students are now part of Generation Z, tech-savvy, hyper-connected, impatient and spoilt for choice, more so than any other generation before. Universities don’t always take their new audience into consideration, and so they don’t use the communication methods their new prospects are most comfortable with. Whilst printing out brochures was enough a decade ago, today it just doesn’t cut it. So what can admissions departments do to win over students in new and innovative ways? A university’s website should be clear enough for first time visitors to find the information they want. We recognise that often, university websites have to cover vast amounts of information, so displaying it clearly and making it easily accessible is no mean feat. If this is the case, then universities must make sure that they provide the necessary support. A positive research process will only improve the students’ perception of your institution and encourage them to apply. 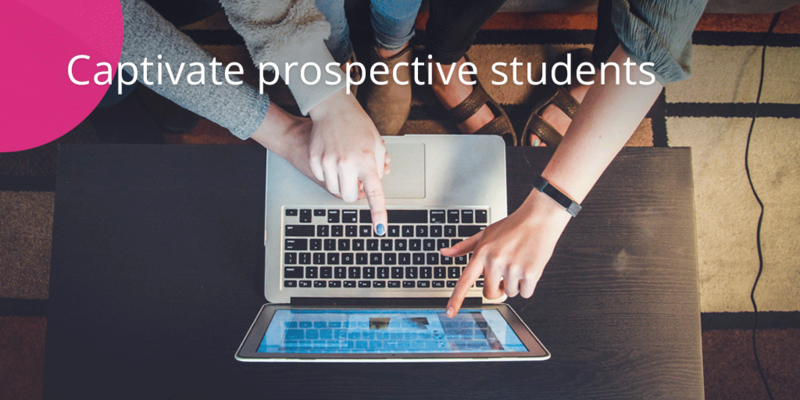 Scenario 1: A student is browsing a UK university’s website from abroad. She has a question about a specific course, so she decides to contact the university. She can only find a contact number, and whilst it is expensive and can be daunting, she decides to place a call. After several redirects and being put on hold for a long time, she finally reaches the right department. Scenario 2: Again, the student is on the website and has a question. She sees a live chat option on the corner of the screen. She types in her question, and is instantly connected to someone that can help. Between these scenarios, it is obvious that scenario 2 is easier and faster. It’s just overall better. Not only is the student in contact with someone instantly, but it gives them more time to formulate their replies. This is especially good for students coming from abroad, who might be a bit more comfortable with writing instead of speaking. In addition, this doesn’t have to come at extra difficulty for the university staff. Not only can they handle more than one query at the time, but the chat can be linked to specific teams on any given course page, ensuring that questions are always directed to the right team. Yes. For both students and universities. Students receive information faster, which makes them happier with the service provided. Also, being able to communicate on a familiar channel takes the pressure off the contact. By chatting, prospective students are able to think about their questions and answers before sending them. Finally, the information is stored, so if the student returns to the website, the university has access to previous conversations. There are also numerous benefits for universities. Chat is a familiar channel for their young audience. It is also a great way to engage with an international audience, as prospective students might be more comfortable with chatting than calling. The university is also able to capture more data; by seeing what pages cause the most trouble, they are then able to modify them. And if you think it is a difficult process and will need hours of IT support, then no need to worry, because getting your live chat up and running can be as easy as copy/pasting one line of code into your site. So why not make the process easier for everyone?